Gobi Tikka is an easy, delicious recipe to whip up. It’s a blast of flavor and has a wonderful texture and the classic yellow we often associate with Indian delights. It’s one of many “pure vegetarian” Indian appetizers or mains that’s easy vegan and works well with a tiffin lunch or dinner on-the-go. It tastes fantastic with rice and also works well wrapped in or scooped up and enjoyed with Indian flatbread: chapati or naan. I’ve had this at restaurants all across India and regularly in my tiffin lunches at the school in Amravati. It’s an easy, popular find outside of India and simple to make at home. Last winter, my mother and I went to an excellent Indian restaurant in suburban South Jersey and we had a fantastic, zingy Gobi Tikka as a starter. As soon as I got home, I wrote down this recipe, which I have since tweaked and tested several times. The tamarind and the ginger push it from interesting to exciting. The other spices contribute to the exotic, eastern flavor. If you’re like me and sometimes oven-shy or impatiently hungry, you can just stir-fry sauté your Gobi Tikka in a large pot in about 8 to 10 minutes on medium high heat, stirring regularly. No baking required! That’s a curry quickie with a happy ending, but baking is the way to get the true roasted and crispy taste. Need more green power and want to go fusion East-West style? Use half cauliflower and half broccoli florets. This will be sure to make the Indian friends jealous– Broccoli is a rare find in South Asia, especially outside of the big cities. Marinated cauliflower (gobi) ready to go in the oven. Preheat oven at 425 F / 220 C / gas level 7. Mix tamarind paste, sugar, and 1/4 cup water. Remove any seeds / pits. Combine all ingredients including tamarind water in large bowl or baking dish. Mix well. Pour everything into baking or casserole dish / tray, mix, make sure all cauliflower pieces are coated with marinade. Bake 20 min, turn and mix all ingredients. Bake another 15-20 min until cauliflower is roasted and edges are browned and crispy. Garnish with chopped parsley or coriander leaves, sprinkle with paprika. Serve with Basmati rice or chapati. Add 1/4 cup coconut milk to marinade for a slightly creamier flavor. This takes the place of yogurt which is often in many tandoori / baked tikka dishes. Store-bought Indian Tikka spice powder may be used in place of cumin, coriander, paprika. Garlic can be replaced with 1/4 tsp asafoetida (hing) powder. If you want a fruitier flavor, substitute 2 Tbs raisins or chopped dates for the sugar / agave. 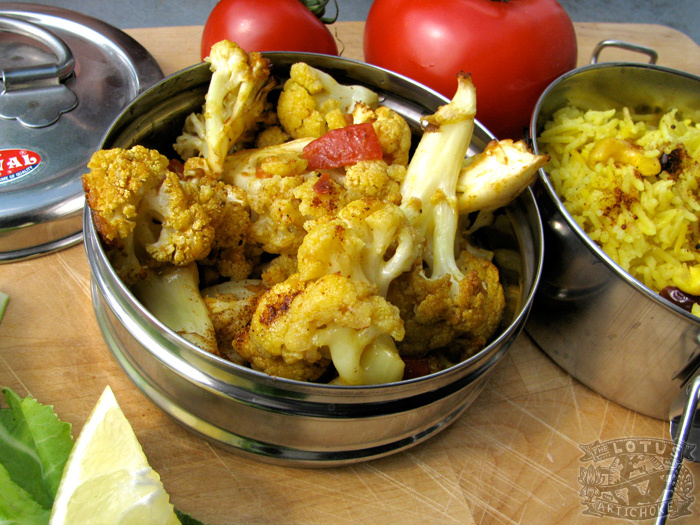 This entry was posted in Indian, North Indian and tagged cauliflower, gobi, north indian, recipe, tamarind, tikka, vegan. Bookmark the permalink. Roasted cauliflower is always a winner! I’ m looking forward to try your Gobi Tikka and we do have the same Tiffins. I think it’s time to use them again. Yes! Take out the tiffins! Please tell me how your Gobi Tikka turns out and if you have any other suggestions or feedback! Danke! I would be thrilled with cauliflower cooked pretty much any which way, but this does look particularly delicious. That sunny yellow hue is incredibly enticing as well, since it promises deeply infused spices throughout! Thanks, Hannah! Not only is it super tasty, but the turmeric (yellow) is a health bonus, too. Good, ol’ ayurveda! Oooh, Fantastic photos and I love the write up you did, R. Yes, the Sindhi Bhindi Masala is crazy delicious and pretty quick and easy. I got some okra and plan to make it tomorrow. 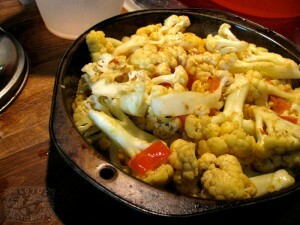 Perhaps I should pick up some cauliflower and make the Gobi Tikka, too. Good combo! Ok, so my husband is north indian. I wanted to make this for him, I accidentally added too 1 tablespoon too much due to misreading the ingredients lol. Anyways it turned out super lemon like and I thought if I added some more tamrind paste with the spices it might make the lemon taste go away. It didn’t, and my gobi turned out a lot darker. I used tamicon’s tamarind concentrate form and added the needed water. Shoud i have not used the concentrate form of the tamarind? Sounds like maybe a bit too much tamarind paste. I don’t know that brand. I hope it was still tasty!